Few coaches see the success that Coach Rick Weinheimer has seen over the course of his career. The guys have made it to the podium ten out of the last 14 years with five of those being state titles. The girls have an equally great history with three runner-up finishes and a state title in 2009. We talked with Coach Weinheimer on what makes Columbus North successful and his favorite memories from his time coaching. How has summer training been going for Columbus North? What does summer training look like for your team? Our school calendar is such that our summer was really short this year. That being said, we were able to have two camping/running experiences, one in June that focused on team and personal leadership for juniors and seniors and the other in July which was our traditional team camp for all our runners. In addition, our veterans held a three day mini campout on their own. During the camps we have a number of hard runs, and the rest of the summer was about building an aerobic mileage base. What are some staple workouts your team does throughout the season? Early August our #1 workout each week is an all-out, fast as you can go, longer run. For the top girls that may be 5 to 7 miles from 6:15 to 6:45 pace and for the top boys that may be 7 to 9 miles from 5:30 to 5:50 pace. That workout transitions later to a workout of 400m at pace (girls 88-93, boys 76-79), with 3 minute jog rest. The girls will do up to 12-14 and the boys up to 16-18. We continue this workout every week including the week of the state meet. We sprinkle in other key workouts, but everything we do in the fall is oxygen delivery (aerobic) based. 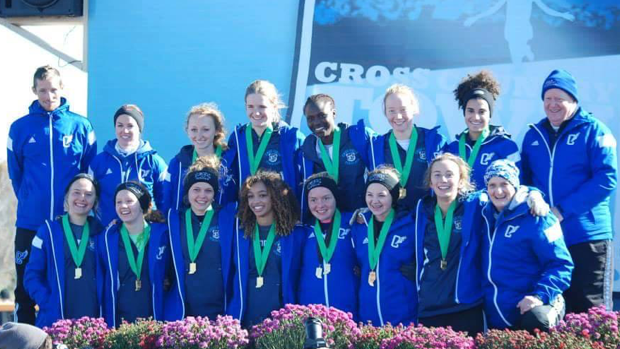 Columbus North has seen continued success on both the boys and girls side - what do you attribute that to? It's hard to answer what things have made our teams successful. We do many things and we try to improve on all of them each year. Our philosophy is broken down into three statements: A) Hard work, given time, will beat talent; B) Every day is a great day to get better; C) To seek excellence, you must become an every day person. Our training, our team activities, and our note-taking/educational sessions are all designed around those three statements. You coach both the boys and girl’s squads; is there any difference in how you approach the boys and girls teams? Sure there's a difference between how a coach approaches boys and girls, just like there's a difference between how a coach approaches individual girls or individual boys. The key is not so much about approaching runners differently based on gender. The key is approaching every runner as an individual and finding out what he or she can tolerate to stay healthy in training, and what he or she finds motivating. It's about building a team but never losing sight of each individual. You’ve been coaching for almost forty years now - what have you learned during that time? What advice would you give to coaches who are just starting their coaching career? I get asked a lot (because I'm old) about the differences between athletes now and athletes in the 1970's. The big difference I see is that athletes (and students) now want to know "why" about all the things they are asked to do. It used to be they just did the things they were asked without much questioning. That being said, I think the "why" attitude is very healthy. Runners are much more self motivated when they understand why we are doing a certain workout, and if I can't answer "why" then maybe I should rethink what we are doing. The "why" keeps a coach evaluating the reasons for everything he does. My advice to a young coach would be to have a solid reason for every single thing you do. If you don't know the reason, don't do it. Over the course of those years, what has been your favorite memory? My favorite general memory happens over and over during each season. I love the days we have a really hard workout, one that is kind of intimidating before we begin, but when the runners finish, they are so chatty and happy because they know they have accomplished something difficult and they feel good about themselves. It's the most genuine self-esteem builder that I know of in education. There are a lot of great specific memories, but certainly one of the best was the state meet in 2009 on the muddiest course I have ever seen. Tough going every single step. The boys ran first, and it was one of those rare state meets where our boys were so dominant that we knew immediately that we had won, only the 3rd team in history to put all their scorers in the top 25 (in our one-class system.) The girls ran next, and we were hoping for a top 5 finish to earn medals. We had been third in the qualifier the week before, beaten by two teams that we had not beaten all season, so we were hoping for top 5 overall. The course was a mudbath; the boys had torn up every bit of solid footing there had been. Girls were covered in mud. Girls were struggling. Our girls just kept moving up through the pack and moving up. Halfway through, I knew we could get medals. In the last 400, I thought "wow, we ran really well." When they added up the scores, it turned out we had won the state championship....and by over 80 points. Everyone else just faded in the mud. To win both on the same day, one in a dominant fashion and the other by complete surprise....it was a truly joyous scene afterwards with runners and parents, a feeling I will never forget. Your team returns six of the top seven from a squad that was fifth at state and 8th at NXN Midwest. With almost the entire team back, what are the goals for the girl’s team this season? Our girls understand the potential of what we have returning, but we really don't set goals based on how we hope/plan to place in certain races. Our goals are always to train hard to make ourselves really difficult for other teams to beat. What is your team’s strength this year? One of the great strengths of this year's team is that everyone wants to contribute, and everyone recognizes that they can demonstrate leadership in many ways. They get that leadership is not just about being loud and visible. It's more about setting an example and being proud of finding a way to contribute to the team no matter how fast or how slow a runner you are.